Magical Monday seems to come and go around here…and this week? It’s here to keep you entertained! 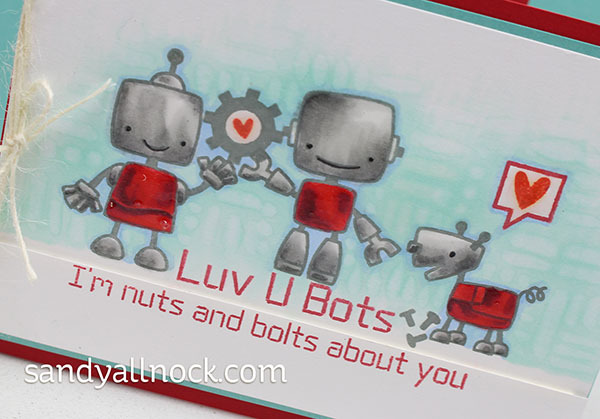 These sweet little robots from Paper Smooches just cried out for some Copic work! I stamped them in a blue grey ink (and the red bits in my favorite red ink)….then went to town with my markers.Watch the video below, or click HERE to see it in HD on YouTube. The shiny little bots also needed a little shine, too – Glossy Accents to the rescue! Then I sliced the paper so I could pop the bottom panel up on some dimension, and tied on some twine to soften it a little. Tools: Tonic 12 Inch Guillotine Paper Trimmer – and I’m getting the 8.5 Inch Guillotine Paper Trimmer too. Total magic! Love the amazing texture and shading you create with the awesome subtle pattern background. Really liked them! It’s nice to see something besides large hearts for Valentine’s Day! As always SUPERB! Could watch your videos all day long. (Sometimes I do).. Thanks for sharing. 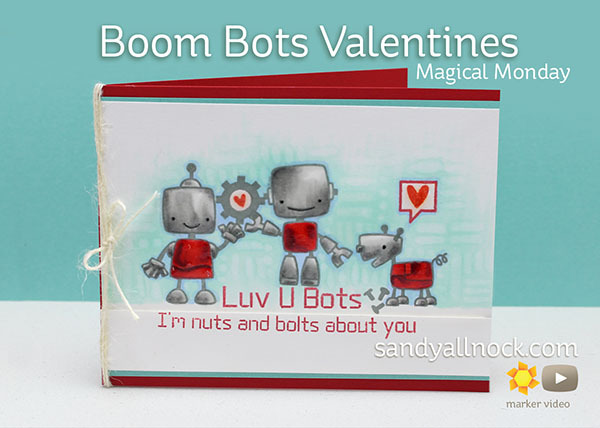 Hi Sandy.Can’t even say how much this card tickled me.The combination of B-BG-O , background really popped these cuties.Fantabulous card.I wouldn’t have known where to begin with a stamp set like this because of the metal look.Thanks for SHARING. BLESSED day. Really cute! I sure do like this set and you did a great job with the coloring as always. I like what you did with the background! Truly magical, Sandy! You brought these little Boom Bots to life. I’m not a Copic person, but I just loved watching you create the beautiful background. Perfect music, too! Hey! You must’ve been tuned into my wavelength this morning – I was thinking about how to use this stamp set for my grandson’s Valentine card – thanks for some great ideas! Hi! Great start to the week. The music was a perfect fit to the card. I loved the shadow outline in B21, but when you added the BG10 it was perfect. The texture you added to the background with 0 was over the top. This is crazy, I’m not that into robots, but I love this card. I look at it and have to smile! Hi Sandy, Great card! I love how you used the colorless blender to give the background that grid look! Welcome back from CHA and congratulations on the new website. It is working fabulously from this side. The little dog bot has officially stolen my heart. Also, red and grey–one of my favorite color combinations! Thanks for starting my day with a smile! Cute card. Love all the coloring…background awesome, how you created each human bolt really cool and the dog bolt…love the dog.